BILL “FUZZY” SHUMWAY GUIDE SERVICE L.L.C. Bill “Fuzzy” Shumway has guided professionally in Northwest Wisconsin counties since 1985. He specializes in fishing for musky, walleye, smallmouth bass, and northern pike. He is the innovator and manufacturer of the “Fuzzy Duzzit ” lure, and “Fuzzy’s Clip N Go” live bait harness. Bill has been featured on The Outdoor Notebook, TV 13 Outdoors, and Midwest Outdoors TV programs, as well as the following magazine publications,In Fisherman, Midwest Outdoors, The Wisconsin Outdoor Journal, and The Outdoor Notebook. Whether a novice or a seasoned angler, Bill will cater to your individual needs. With a variety of lakes available for fishing, Bill will select the right one for your days outing. Using traditional methods as well as a few innovative techniques, Bill will show you tips on proper boat control, lure selection and patterns for seasonal fish location. Fishing starts at ice out, usually Mid- April for Trout, Salmon and Steelhead on Lake Superior’s shores and streams. On the first Saturday in May, Wisconsin opens its inland waters for Walleye, Northern Pike and Panfish, While the Musky opener is the fourth Saturday in May. By the first week in June, summer patterns start to ‘set up’ for both Walleye and Musky. Numbers of fish as well as the trophies are caught starting in June and following through the ‘Dog Days’ of August. Although the numbers of fish tend to stall a bit in October and November, the months have a reputation for producing large, heavy fish. 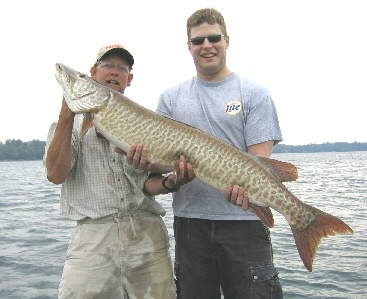 Bill’s first love is guiding fisherman to their first Musky or first trophy one. Whether a seasoned musky angler or new to the sport , Bill will provide you with the tools, skills, and knowledge for a great Musky trip. Top quality St. Croix rods, St. Croix reels, and lures are included for your success. You will fish from a comfortable 1860 Ranger Deep V with a quiet 90 hp Suzuki outboard motor, powerful Minn Kota trolling motors, and Humminbird electronics. You will employ traditional casting techniques most days, but you may also fish live bait or power troll depending on seasonal patterns. Trailering his boat daily Bill will take you to the lake of your choice, or by his recommendation for action or trophy fish. He will pick you up in front of your cabin for a road trip, or at your dock to fish your home water. 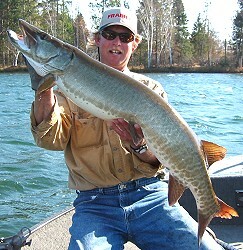 Bill fishes Musky from the May opener until the November close of season. 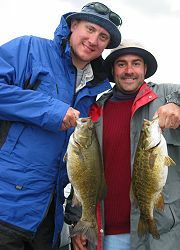 Prior to the Musky opener Bill specializes in trips for Walleye, Smallmouth Bass, and Northern pike. Bill fishes a wide variety lake types for Walleye. You may request fishing for numbers of ‘eater’ sized fish or hunt for that first big ‘Eye’. Bill has a reputation in the Hayward area for consistently connecting his clients with trophy Walleye every season. Light tackle casting techniques along with live bait are the norm at this time of year, however casting crankbaits in the evening can produce some big fish at this time of year. Bill recommends bringing your own rod and reel combo loaded up with fresh six pound line, or you may use one of his St. Croix rod outfits. All lures are provided, there may be charge for live bait used depending on market prices. Fishing outings in the Northwood’s is a great way to entertain or to relax after your companies business meetings are through for the day. They can accent your team meetings, or can be a fun competitive outing to highlight your corporate event. Bill can help arrange guided outings for large groups with competent and reliable guides, lodging, catering and other needs for your event. The Hayward Cable area has many various lodging options to choose from; Resort cabins, Full service resorts with marina, restaurant and bar, Bed and breakfast’s, motels and condominiums. Bill can suggest and help you find a place for you and your group or family. Plan ahead the best places are booked well in advance. A Safe, Comfortable Ranger fisherman 1860 fishing boat. Panfish cleaning and wrapping.A Fun, Educational Northwood’s Experience. Appropriate Seasonal Clothing including Sun Glasses & Rain Gear. A Valid Wisconsin Fishing License. Lunch for You and Your Guide.